Mango is one of the most loved fruits all over the world. Summers in India are rich and pleasant only because of these juicy and fleshy delights. India holds about 40% share of mango production in the world. Thus, the country proudly holds the title of ‘top producer of mangoes’. If we consider the production state-wise, Andhra Pradesh is the top mango production state with an average of production of 24.5 lakh tonnes (between 2010-14). It is then followed by Bihar, Odisha, Karnataka, and other states. Unfortunately, in the last three years, the yield and quality both have gone significantly low due to the anti-climate conditions. This year has been no different in a certain respect. In the state of Andhra Pradesh, severe cold, snow and fog during the nights and increasing temperatures during the day has already damaged mango flowering. 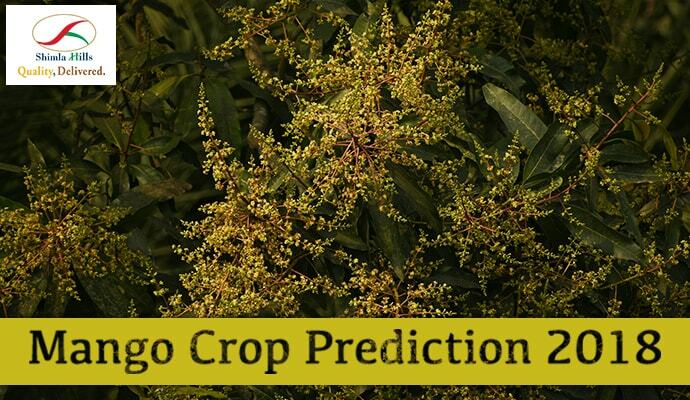 Moreover, the powdery mildew also affects mango flowers to a large extent. In Visakhapatnam, the ‘Panukulu’ flowering has been severely damaged due to the temperature variation. According to experts and farmers, the shortage of water may reduce the production of Kesar mangoes this year South Gujarat, Kutch. Thought the state government has warned its citizens about the shortage of water this summer, it is still optimistic. There is a weather prediction that from March 15th, heat will increase and will fetch good news for the farmers. But if farmers are to be trusted, the inadequate water may reduce the mango production by 10-15%. Shimla Hills relates to the plight of the farmers under these varying climate conditions. From its inception, Shimla Hills has believed in providing superior quality processed mango products nationally and internationally. It hopes for better climatic conditions to develop and an incredible mango season ahead.